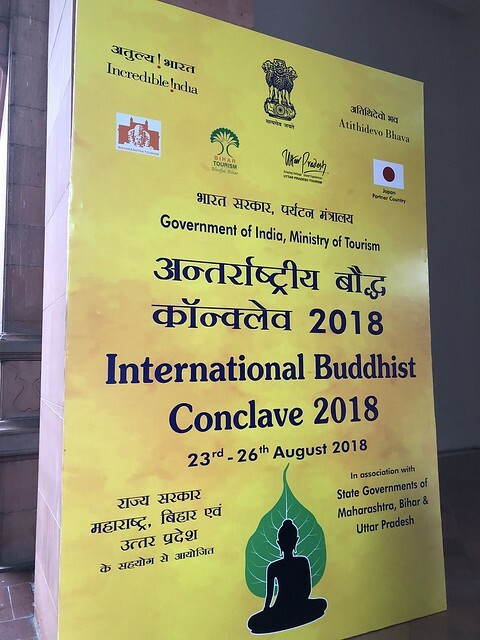 NEW DELHI—The 6th International Buddhist Conclave opened in New Delhi’s Vigyan Bhawan convention center on Thursday, hosted by the Ministry of Tourism, who partnered with the government of Japan as their co-organizer. The theme of this year’s conference is: “Buddha Path—The Living Heritage,” with a focus on India’s Buddhist tourism circuit. The conclave includes forums focused on input from Buddhist leaders, opinion-makers, and media on the right approach, as well as business-to-business meetings between tourist operators, entrepreneurs, and other private stakeholders in Indian tourism. Delegates from more than a dozen countries will also visit several sacred Buddhist sites over the next days. The conclave opened with a welcome address by the secretary of the Ministry of Tourism, Rashmi Verma, and a speech by Japan’s ambassador to India, Kenji Hiramatsu, who spoke about the “Indo-Japan friendship.” According to Hiramatsu, the conclave’s initiative of encouraging tourist operators to promote pilgrimage programs and itineraries internationally “perfectly justifies Japan’s participation” due to India’s long-lasting ties with Japan through Buddhism. “Few ties between Japan and India are as treasured as Buddhism,” he noted, adding that Japan had invested significantly in conservation projects, particularly in Maha Bodhi Temple and the Ajanta Caves. He also observed that infrastructure, connectivity, and sanitation were some of the key components to be improved in this ongoing initiative. The president of India, Ram Nath Kovind, gave a speech on how Buddhism’s has been—from its peaceful expansion across the subcontinent and via the Silk Road, as well as its export of culture and trade—an “early basis for globalization.” He spoke of five primary states involved in the development of the Buddhist circuit: Uttar Pradesh, Madhya Pradesh, Bihar, Gujarat, and Andhra Pradesh. Kovind noted that there were some problems complicating the development of the circuit, including limited market research, pollution and environmental challenges, and gaps in transportation and infrastructure. He concluded his speech by saying that such issues were nothing in the face of the Buddhist circuit’s incredible potential. The ceremony concluded with the president inaugurating the launch of a new tourist website titled “Land of Buddha,” developed by the Ministry of Tourism under the “Incredible India” banner. The afternoon comprised three separate panels: the first was a panel where speakers from Japan and government representatives from seven Indian states—Sikkim, Andhra Pradesh, Bihar, Madhya Pradesh, Uttar Pradesh, Gujarat, and Maharashtra—presented their Buddhist sites and attractions, as well as investment opportunities for entrepreneurs and developers. The second was a business-to-business meeting between domestic and overseas tourist operators, many from Southeast Asia and Europe. The third was a dialogue hosted by Dharmacharya Shantum Seth, an Indian-born Buddhist teacher of Plum Village, with Buddhists from various countries, including Norway, Singapore, and Brazil. Buddhist representatives shared their opinions and advice on how to develop an authentic pilgrimage circuit while balancing economic development that would appeal to Buddhist sensibilities. Speaking on behalf of Buddhistdoor Global, I observed that while India’s focus on conservation and development of the sites was commendable, pastoral guidance and a local Buddhist presence at or near the sites themselves also needed long-term development. Many other delegates echoed the concern that the government’s approach over-emphasized investment and economic growth, rather than framing the circuit in a way that would appeal to Buddhist pilgrims. Indian Buddhists and government officials responded by noting that India, despite being the heartland from which Buddhism sprang, needed input and advice from all countries that had inherited the Buddhadharma, so that all could engage in interconnected, mutual learning. The conclave continues with delegates travelling to Aurangabad in Maharashtra State to see the Ajanta Caves on Friday, and flights to Nalanda and Venu Nav (Bamboo Grove) the next day. Visits to Bodh Gaya’s Maha Bodhi Temple and Sarnath on Sunday will conclude the event.